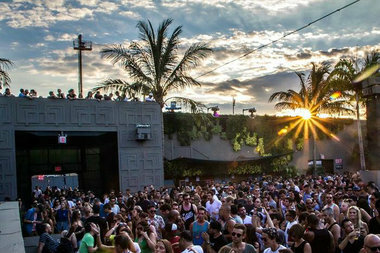 The Community Board voted to deny a liquor license to Brooklyn Mirage, a 6,000 person venue in the East Williamsburg industrial park. EAST WILLIAMSBURG — A slew of safety violations prompted city building inspectors to shut down a 6,000-person party venue for the second time in three weeks, according to an email sent from the Department of Buildings to the local community board. When inspectors visited Brooklyn Mirage at 111 Gardner Ave. on Friday, they found wooden platforms and decks that didn't appear structurally sound, gas piping that had been installed without a permit, extension cords being used instead of permanent wiring, plywood structures that weren't fire-rated and no evacuation plan for the site, inspectors wrote in the letter. The owners also couldn't provide drawings for the scaffolding used in the structure, the site was missing exit signs and had several unsafe exits, according to the note. The most recent vacate order issued to Brooklyn Mirage, a sprawling outdoor and indoor complex at 111 Gardner Ave. in East Williamsburg industrial park known for its electronic dance music raves called CityFox, comes after an earlier DOB vacate order for safety hazards as well as police crackdown in May during which the venue's liquor was confiscated. It comes on the heels of the Department of Buildings issuing a vacate order on the site on May 26 for lacking necessary emergency lighting and exit signs, according to Alex Schell, a spokesman for the DOB. Those violations were soon corrected, he said. Troubles with Brooklyn Mirage have been mounting since last year when they hosted dozens of pop-up parties and events nearby at 99 Scott St. using catering permits, allowing them to circumvent state restrictions that only allow four pop-up event liquor licenses at any given venue in a 12-month period. Last Halloween, organizers tried to throw a rave inside the NuHart Plastics Building in Greenpoint, a state Superfund site, which was later shut down. Finally this spring when Brooklyn Mirage opened at their new location at 111 Gardner Ave. on May 21, they did so without proper event permits to allow the sale of liquor. All their alcohol was confiscated by police. They've been hosting dry events since, a spokesman said. The ongoing issues with the venue led the community board to implore the State Liquor Authority to reject Brooklyn Mirage's application for a liquor license this week. "They have lied straight to everybody's faces," said community board member Karen Nieves. "How could we support them?" Following the vote, the board wrote a letter to the SLA rattling off dozens of reasons for the board's rejection of their application, including city violations, concerns about hours of operation and structural concerns. "[Their] construction materials are merely 'theatrical backdrops' creating an illusion of sturdiness not unlike a house of cards," the June 17 letter reads. Nearly a dozen representatives of Brooklyn Mirage had showed up earlier this week to a community board meeting where they hoped to defend their application for a permanent liquor license. [There are] 35 palm trees, 15,000 living plants...[It's] unlike anything most people have ever seen," said Simar Singh, who said the owners imagined opening up the space to the public for free, rolling out Astroturf and screening movies or, if they get permission from HBO, the "Game of Thrones" finale. Brooklyn Mirage, which has financial backing from Cayuga Capital developers James P Wiseman and Jacob Sacks, has two massive indoor halls and a sprawling outdoor space that can be rearranged to cater weddings and charity galas, not just raves, Singh said. They hope to bring more than 300 jobs to the area, he said. "I really think this is such a unique space you need to see it in order to appreciate what it has to offer," Singh said. He declined a request for further comment.